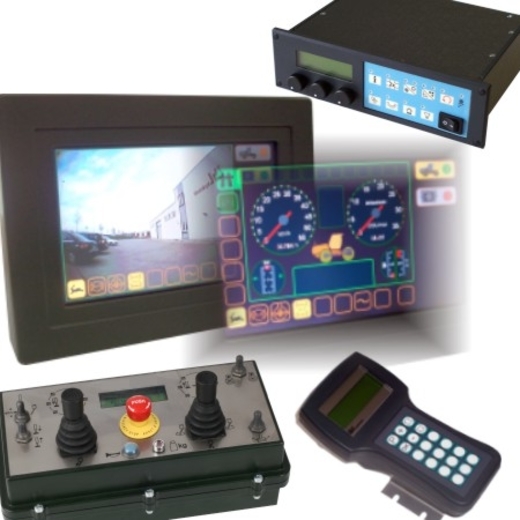 The units of iblos human-machine interfaces are operate and display devices for the application in mobile working machines of the municipal, construction and agricultural technology as well as in commercial vehicle superstructures. IBL-hydronic offers a wide range of interface units for different applications. The HHI-20 combines the control system with a graphical operate and display device for the application in mobile working machines of the municipal, construction and agricultural technology as well as for commercial vehicles. Because of the high computing and graphic power the iblos-HHI-20 is particularly suitable for complex control systems with extensive operate options. So you do not need a separate central control unit and you need only lowcost I/O-units on the CAN network for controlling your machine. The HHI-20 realizes operate control screen in independent graphic layers, the camera picture in real-time shown in a separate and independent video-window and the complete control of the machine. The devices are application-specific constructed with previous operating and displaying elements, joystick, text or graphic displays. It is also as control computer usable and particularly qualified to control working platforms and cranes. Usable as control computer with integrated operating and displaying function for small-sized control systems. In service and production the HHI-01 can be used as hand-held parametrize device. The devices are application-specific constructed with previous operating elements and plastic foil keyboard. The device has a graphic display. They are particularly suitable for the application in motor trucks and transporters.